A taco truck in the middle of an abandoned car lot gives off an understandable foreboding sense in one’s mind, but if you can quell that survival instinct, you’ll soon be rewarded with delicious taco-ey sustenance. Their menu is quite comprehensive considering that it’s a truck, if not a little difficult to read because of how they split off their meat options into different sections. While I’ve always wanted to try their burrito or a sope, I’ve truthfully never been able to get past their astonishingly delicious street tacos. Their tacos won me over at first bite, and I have a hard time justifying the thought of having a burrito with a minimum of 4 tacos… because I would need that reassurance of a backup plan. Below the order window lays a giant bath of drink options, all of which kept at perfect sipping temperature with crushed ice. I personally can’t resist the temptations of a giant liter bottle of Coca-Cola that’s been ice chilled as the aroma of carnitas wafts through the air. While your order gets cooked up, you’re tasked with deciding how many ramekins of their flavor packed hot sauce you’re going to be drowning your tacos in. Grab a couple of slices of fresh lime to brighten up those carnitas a touch, and some pickled condiments if you feel like having a little munch before your order is ready. Once that container of taco goodness has descended upon you, the genuine feeling of giddiness takes over. 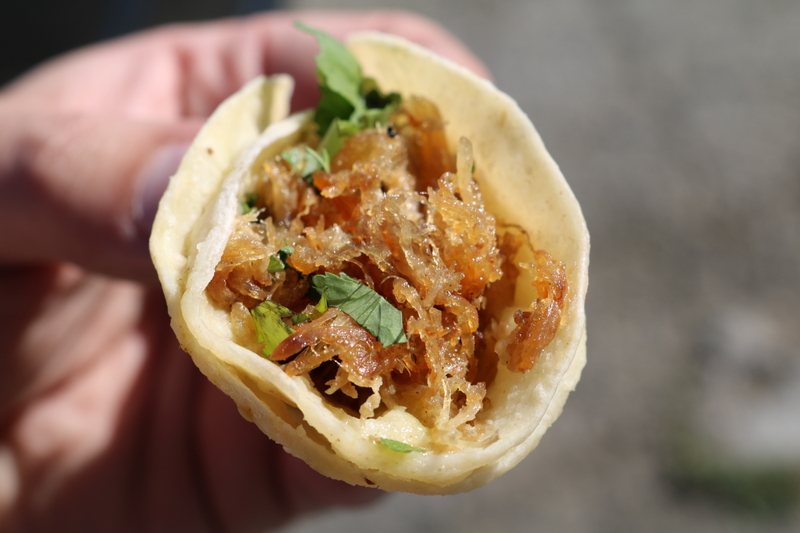 These are street tacos defined: crisped tortillas filled with amazing meaty goodness; cilantro, and onions provide some texture and balance to it all. This particular day I went with three meat options: Carnitas, Cabeza and Carne Asada. The carnitas are probably the safest and consistently delicious option. They’re fried till beautifully crispy, and almost dry in texture. The addition of a little lime and hot sauce really makes these shine. Next up we have my favorite, the cabeza taco. These are beef cheeks that (I believe) they braise off with herbs and spices. They’re incredibly supple in texture, and the flavor is beefy & unctuous. This pairs beautifully with the crisped tortilla, and firm texture of the onions. The cabeza might not be for everyone; it’s fairly fatty in mouthfeel and flavor, and I’ve had an occasion or two where a few chunks of fat were thrown in the taco which kind of ruins the experience. So it’s a little bit of a coin flip, but usually it’s just delicious beefy goodness. One stumbling block for them is their Carne Asada. Its flavor is just okay, and the texture is typically like chewy ground beef. I imagine this is left in a steam table for a while after cooking because it never feel like it has any life to it. If they threw this on a hot griddle to get some browning on the meat, I think it would go a long way to making this taco staple a much more appealing option. A fair warning, I wouldn’t be wearing your Sunday finest while going out to eat here. 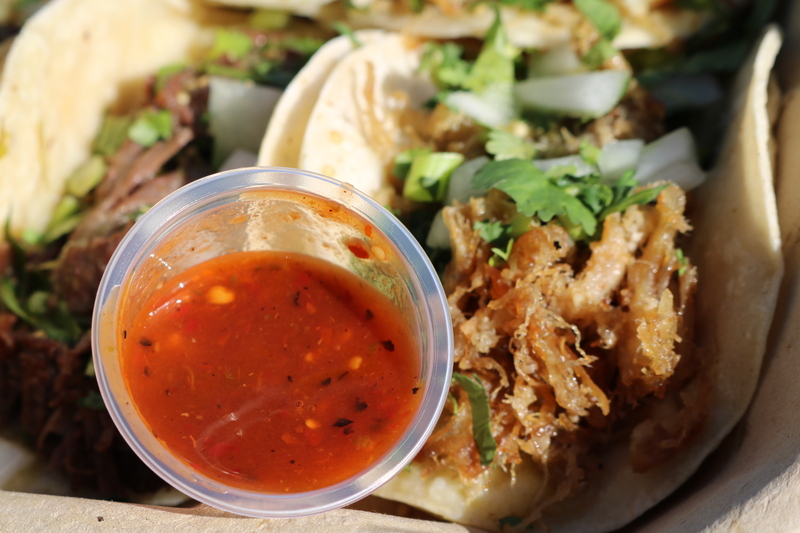 These are 2-3 bite tacos, that should be enjoyed outside your car while leaning away from your shoes, because that fatty goodness and hot sauce are going to fall wherever gravity takes them. Ofelias is serving the best tacos I’ve had in the East Bay. The carnitas there is the backbone of their menu, and the cabeza is a delicious treat for the more adventurous out there. Maybe the carne asada is a good option when it’s mixed up with other things in a burrito, but feel free to pass it up in taco form. For random trucks parked in vacant lots you can’t do any better than Ofelias Taqueria Truck.